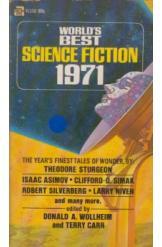 Worlds Best Science Fiction 1971 Donald Wollheim Terry Carr Sci Fi. Book is in good condition, all pages intact. A collection of short stories from some of the greatest names in science fiction history. Includes titles by Isaac Asimov, Theodore Sturgeon, Larry Niven, and others.